Finks (Paperback) | The Drama Book Shop, Inc.
On the verge of TV stardom, comic Mickey Dobbs meets actress and activist Natalie Meltzer, and their romance blossoms—as does the risk that they'll be blacklisted for their political activities. In the face of the House Un-American Activities Committee, tasked with exposing communist subversion in New York's entertainment world, Mickey and Natalie endure the absurd and tragic process that victimized entertainers and turned friends and colleagues against each other. For some, the blacklist will mean a decade without work. For others, it will spell the end of their careers. And those who willingly testify—naming others to the committee—will be branded as "finks". In Finks, Joe Gilford documents the struggle his parents, entertainers Jack Gilford and Madeline Lee Gilford, endured when they were called to testify. "Joe Gilford's impassioned, autobiographical FINKS…is a testament to the parents who managed to maintain their indomitable spirit throughout the ordeal." —Huffington Post. "…a bracing play about McCarthyism." —NY Times. 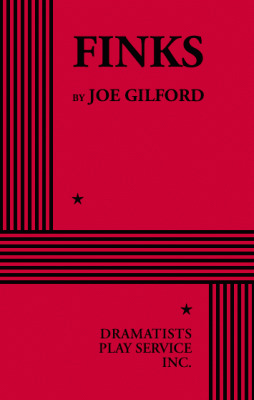 "Forget blue jokes; the humor in Finks, Joe Gilford's farsighted yet tender tribute to his blacklisted parents, is distinctly red. But it's part of what makes this play…as Gilford tries to understand why some of the accused betrayed friends to keep their livelihoods, he demonstrates a pluck similar to that of his parents." —Time Out NY.